Posted on August 13, 2018 by Ava Sharifi. This entry was posted in Staying Healthy and tagged sitting disease, Staying Healthy. Bookmark the permalink. Whether you are driving to work, eating a meal with your family, or taking a rest in front of the television, there is a common factor: the act of sitting. A typical American is sedentary for 21 hours out of the day. 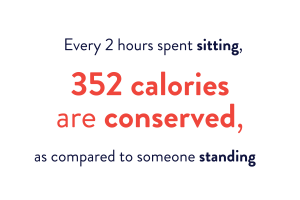 Including exercise and physical activity, people across the U.S. only spend approximately 3 hours out of the day simply standing. 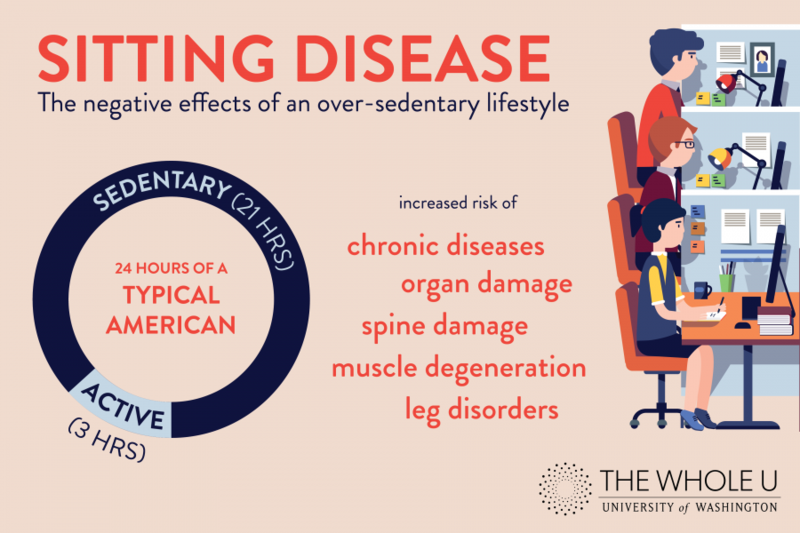 This phenomenon has been coined as “Sitting Disease,” which, broadly speaking, is defined as a condition of increased sedentary behavior associated with adverse health effects. Sedentary behavior can be defined by two things: the position you are in, which is generally reclining or sitting, and the amount of energy expenditure that your body is experiencing. However, in our new age of easy-access technology, the majority of Americans stare at a computer screen for the majority of their day, whether it be at an office desk or at home. If not, we are looking at the computer in our pockets – our smartphones. 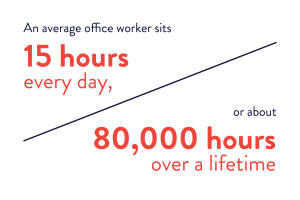 An average office worker sits for 15 hours every day, which calculates to about 80,000 hours spent sitting over a lifetime. Technology has become an accepted part of our everyday lives, but that doesn’t mean we shouldn’t be cognizant of what our bodies are doing while we are using technology. Staring at your computer with poor posture causes “the development of a hump at the top of your back, the shortening of your hip flexors, shortened abdominal muscles, a caving chest, weakened shoulders, arm pain, numbness and tingling in your extremities, and worst of all, traumatic pressure on the disks in your back. All of these symptoms are not uncommon,” Dr. O’Connor explains. We know that it is difficult to be removed from technology and we aren’t suggesting to leave your job at the office. Instead, we emphasize the importance of awareness in terms of your posture, bodily movement, and the amount of sitting/reclining per day. For every hour of sitting, try to get about ten minutes of standing in. For every 30 minutes that you are doing work, there should be 20 minutes of actual computer work, and then a 10-minute break. That 10-minute break should be 8 minutes of standing and 2 minutes of stretching. Check out the Whole U’s Flex at your Desk and Stretch at your Desk handouts to learn a few movements that you could try at work! When you are sitting, think of an ergonomic posture – bringing your keyboard and mouse closer to your body, keeping your shoulder blades pulled back, relaxing your elbows by your side, and maintaining a neutral spine. The Whole U’s Working with Better Posture program is a great place to start! You can also combat “Sitting Disease” through small things. Try parking farther away, standing while you eat lunch, and doing one-leg balance stances while you watch television or brush your teeth. Alongside standing, aerobic exercise is extremely important. As recommended by the HSS, you should be performing a minimum of 30 minutes of moderate intensity aerobic activity about 5 days a week or 20 minutes of vigorous intensity aerobic activity about 3 days a week. 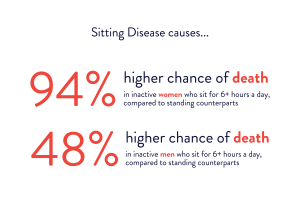 Fight against the avoidable effects of “Sitting Disease” by standing up and moving away from a sedentary lifestyle! UW should just be super radical and give all employees an hour of paid PE a day. If physical activity was a paid part of the workday, kind of like how PE was a required part of high school, at least when I was in school, I bet UW would save lots of money on the healthcare costs of its employees. If UW wants to change this trend, it has to change the system, it’s not being very realistic if it expects employees to engage in physical activities during their unpaid lunch hour. Anybody know of a grant I could write to try this, or would the state of Washington just have a fit over the idea? ?